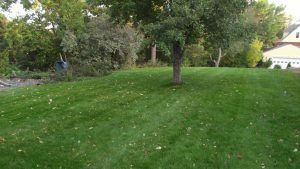 A yard managed by Green Core Organics, three years after being converted from traditional lawn care to organic lawn care. The lawn was aerated and overseeded with a fescue mix to create a thicker, healthier lawn. The deeper roots in this lawn require less water. Q. Everyone loves a lush, green lawn. But what happens when we fertilize? pumped up and begin to rely on steroids to maintain that unnatural state. Grass that is kept lush and green with fertilizers relies on chemicals to maintain a state, too. We “pump up” the grass artificially. Our lawns are not being sustained by healthy soil. Our lawns are being unnaturally sustained by artificial inputs. Q. Fertilizers and other chemicals, such as herbicides, affect grass. Do they affect soil, too? A. Yes, keeping with the analogy of the human body, our bodies are made up of all kinds of healthy bacteria and microbes, which are a necessary part of human function. This is true for soil, too. Soil is filled with microbes: bacteria, fungi, protozoa, nematodes, mites, and microarthropods. These invisible, beneficial creatures are integral to good soil health. Applying synthetic chemicals such as fertilizer, herbicides, fungicides, and pesticides, kills off these healthy microbes. Chemicals—including chlorine from our hose water—kill 90 percent of healthy soil microbes, the very microbes that are the key to lawn health. Q. Do synthetic chemicals affect what is growing in that soil? 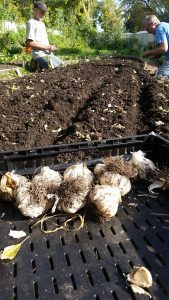 A single teaspoon of rich garden soil can hold up to one billion bacteria, several yards of fungal filaments, several thousand protozoa, and scores of nematodes, according to Kathy Merrifield, a retired nematologist at Oregon State University. Photo Credit: Open Farms. A. Grass, as well as the food we grow and eat, are impacted by soil quality. For example, soil microbes break down twigs, leaves, grass clippings, and branches and recycle nutrients naturally back into the soil. This results in nutrient-rich soil. Healthy soil impacts plant health. This nutrient recycling is part of the natural circle of life. If we destroy microbes, we destroy soil health. Q. People often think that organic lawn care means weeds and ugly grass. A. I think the issue is having patience to let a yard transition from chemical care to organic care. We start with a soil analysis to understand the unique characteristics of a particular lawn. Based on the soil profile, we know what amendments need to be made. The “tools” in our toolkit are natural amendments. For example, kelp provides minerals and vitamins. Soybean meal is a protein that provides nitrogen, a key element of chlorophyll production. Iron can be added to lawns to dehydrate weeds. We even introduce microbes into a lawn that destroy chlorine from hose or sprinkler water. All lawns are different so there is no one formula we use. We start with five applications that are designed for a specific lawn. We shift to three as a lawn stabilizes. It takes time to wean a lawn off of its “chemical dependence” to lawn care that uses organic inputs and relies on natural nutrient recycling. The key to good organic lawn maintenance is the timing of these organic applications. Q. How else do you care for lawns? A. We aerate by removing a 2 ½” soil core and dropping the plug onto the lawn. Oxygen can then better penetrate roots so that they grow deeper. Longer roots require less water. We wean grass off of water dependency and the need for timed sprinkling. Watering becomes necessary only in the most severe conditions. We also overseed after core removal. We usually do this in the fall so that grass can germinate over the winter. Fresh grass emerges in the spring. This means denser grass and less space for weeds to germinate in the spring. We use a mix of 7-10 varieties of grass, including fescues. We have weather extremes in Minnesota. It can get very hot and very cold here, with wide fluctuations in temperature as well. And those fluctuations can happen quickly. Our yards can get very dry. Likewise, they can get very wet. No single grass is resilient enough to handle all these conditions. With a mix, we have a range of grasses that “come to life” as others may be going dormant or have yet to emerge. For example, red rye in our mix thrives in temperatures that are too cool for Kentucky blue grass (the type of grass that is predominantly used in most Midwestern lawns). No mow and slow grow grasses are great for slopes and hills, as well as areas that are hard to mow. These grasses are also wonderful for a more natural “meadow” feel in certain areas in a yard. Q. And, the question everyone has: is organic lawn care more expensive than traditional lawn care? A. At the beginning, it might be. However, we have found our pricing to be comparable with traditional chemical lawn care firms. As the soil begins to heal over time, costs decrease. Grass starts to grow more slowly, which means less mowing. Nutrient inputs are reduced. Roots grow deeper, which in turn requires less watering. And, our products are all natural and safe—kids and pets are always welcome. To learn more about Green Core Organic Lawn Care, visit www.greencoreorganics.com. John Coatta can be reached at info@greencoreorganics.com. Interested in more articles on how to green your yard, block, neighborhood, community? Sign up to receive The Butterfly Effect journal in your inbox twice a year. The Butterfly Effect is published four times per year by Neighborhood Greening. Sign up to be notified when new issues are published. If you have already subscribed, Thank You! Thank you for subscribing! Please check your email to confirm and activate your subscription.